How can newsrooms do more online with fewer resources? By leveraging the reporting that bloggers in their communities have ALREADY published on the web. Using “local link journalism,” reporters can seek out and link to reporting on a story that’s been published across their local blogosphere and just needs to be pulled together. And isn’t pulling together the threads of a story what journalists do? For example, this weekend it snowed in Tennessee — in March — not exactly a common occurrence. It’s a great old fashioned human interest story. Knoxnews.com published a news story with the facts about the storm. But what about how it’s affecting people in the community? Traditionally, that would mean sending a reporter out to do interviews and a photographer to take pictures… in the snow. Or it would mean making do with some wire copy and photos. But the beauty of the web is people in the community were already posting their thoughts and pictures online. So all Knoxnews.com had to do was link to them (using Publish2, of course). A miracle has happened! It is snowing in Tennessee… in March no less. Just when I thought Spring was right around the corner, Winter has made a comeback. I am practically giddy about it. You may be wondering why I am so excited. After all, snow is a regular part of Winter, right? Well, if you live in Tennessee, snow is almost non-existent. According to my very scientific calculations, Tennesseans will enjoy a significant snowfall (minimum 2 inch accumulation that stays on the ground for 2 or more hours before melting) every 4.5 years. How pitiful is that? I know others snicker at our reaction to snow in middle Tennessee – I do not care. This is magic, every minute to be savored. Snow of any measurable amount, around here, is fleeting and rare. For places north and west, by this time of year there is a snow-weariness; a been-there-done-that kind of attitude. To be honest, I wouldn’t blame a northerner for feeling that way. But not here. The whole town seems to be wrapped up in a breathless giddiness. The television news reporters, ever since last night, have seemed like they were going to burst with anticipation. It’s like a million people, all at once, were filled with the joy and anticipation of a night before a big trip to Disney World. Laugh at us, if you will – but when was the last time you and all of your neighbors felt giddy? Could heaven be like this? 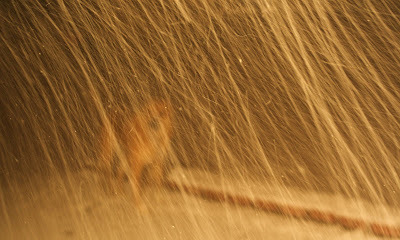 It snowed steadily all evening. 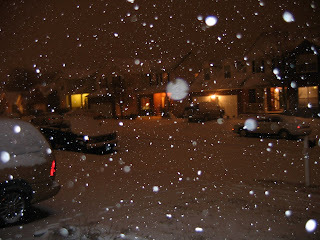 When Gail and I went to bed it was still snowing—big beautiful flakes. I woke up at 6:30, scurried outside, and snapped a few photos before anyone spoiled the thick white blanket with foot prints. I realize that these modest snowfalls make northerners laugh. But when you live in the south, you take what you can get. This is the latest snowfall we have had since 1996. It is also the biggest snowfall we have had since 2003. My guess is that we had about three inches in Franklin. I took these pictures at 9:30 tonight…the kids wanted to go outside “right now!” We have about 2 inches so far…not bad for middle Tennessee. We have the snowpants, boots, socks and gloves all ready for a morning in the snow! We got about 4 or 5in. of snow last night here in Ashland City. I dont think Nashville got near this much. That is what we get for living north of Nashville!! Well, I tried to find a sled all day yesterday but didnt succeed, so I had to “redneck it”, which I am not ashamed to do!! 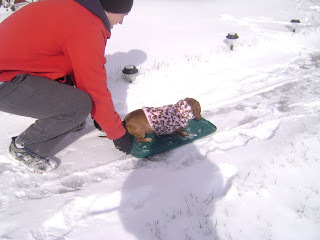 Lucy is sledding on a Tupperware lid! She didnt really like it but looked too cute! Jason says she looks like a gay leopard in this jacket! Sure, this was just weather, but if you read through the blog posts, you’ll see that it really touched people deeply — and it was a shared community experience. Who else is going tie all these threads together? It made perfect sense for Knoxnews.com to do it. There’s so much opportunity on the web — it’s just a matter of seizing it. So how can the web make LESS work for journalists rather than more? Which weekend assignment would you have rather had? The web doesn’t have to be harder for journalism — it can be much, much easier — it’s just a matter of learning how to use the web.